The food we consumes provide nourishment and gives energy to our body, it gives us the ability to do daily activities and help improves our health in direct as well as indirect ways. A healthy and fresh diet is the most important way to keep ourselves fit. The food items kept at room temperature undergo rapid bacterial growth and chemical changes in food. Taking unhealthy food leads to bad health, and can cause different food borne diseases. The purpose to use biosensor and electrical sensors is to determine the freshness of food. A smart system which can detect the freshness of household food like dairy items, meat, and fruits. The identification and selection of pH sensor, Moisture sensor, and Gas sensor to develop a smart food freshness detector ensures the freshness of food and tells whether to eat it or bin it. An android application is developed to select the type of food to be checked. The food we consume can affect in any form of contamination that may occur due to storage or chemical changes within the food. There are several viruses and bacteria that causes food contamination and leads to numerous food borne diseases, for example Norovirus a very contagious virus caused by contaminated food or water . About 351,000 people die of food poisoning globally every year . In a country like Pakistan, majority of people struggles on daily basis for food, due to preservation of foods and use of chemicals to artificially increase the time span of food causes people illness. It is necessary to develop a system that can help people to identify the freshness of food or quality of food items.Our proposed system may give the good quality (freshness) management in food. It is based on electrical, and biosensors. Biosensors play a vital role to detect the bacterial contamination in food sample. Based on the combination of the sensor outputs quality of the food should be detected. level.The block diagram below shows the model of device. The device consists of a microcontroller Arduino Uno, Bluetooth module, electrical and bio sensor like pH sensor, moisture sensor, and gas sensor. 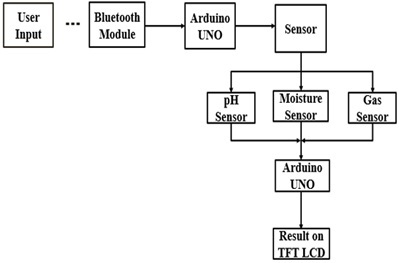 The food to be checked is attached to the corresponding sensor and the user can input from Android mobile application, the selection of food item from application gives command to Arduino Uno with communicating through Bluetooth module. The microcontroller take readings from the sensor and decide result with a predefined algorithm. The result is in the form of “Good to use” and “Not good to use” depending upon the food freshness level. The output is shown on a LCD. Freshness of food is one of the most important property in every food items. Following properties are selected for their respective food item to be checked by different sensors. The potential of hydrogen (pH) is used to specify the acidity or alkalinity of solution. A solution commonly measured on a scale of 0 to 14 . Standard pH of diary items such as milk, and yogurt is very important, as due to the logarithmic nature of the measurement, even small changes in pH are significant. The standard pH of milk is about 6.5-6.7 . A pure fresh milk should be round about this pH value standard. A change of 0.3 in pH value represents a doubling of acid concentration  .Variations of pH can affect the flavor, taste, and shelf-life of dairy products as milk is main ingredient in any kind of dairy food item. pH sensor is best choice for dairy items. Moisture is the small quantity of water within a solid or condensed on a surface of any material. Meat and poultry are composed of naturally occurring water, muscle, tissue, bone, and fats. Everybody eat meat for the muscle. There are approximately 75% muscle in meat. With the kind of meat the naturally occurring water contents differs . The water contents in meat item whether it is chicken or beef assures the freshness of meat as too much wet or dry meat is not good to consume. Too much water contents in meat items changes the pH level as well as chemical composition of meat which affects the freshness of meat. Moisture sensor is best for checking the moisture contents present in chicken and beef. Ethanol is a naturally occurring substance also known as Alcohol. Ethanol plumes can be used to localize ripe fruit artificially, and low-concentration ethanol within fruit may act as a feeding stimulant . Fruit ripening is associated with changes in color, taste, sugar, and ethanol content. When fruit like banana start ripening its chemical properties changes with production of different gases like ethylene, and ethanol  in small amount, this amount increases with passage of time. A gas sensor is used to detect the production and concentration of ethanol in banana. 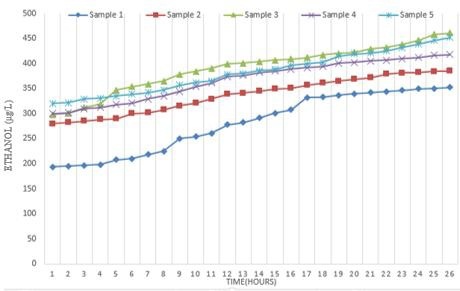 The graphs shows the increase and decrease in parameters of food items checked. The lactose sugar in milk is converted into Lactic Acid by Lactic bacteria which lowers the pH level of milk, with the passage of time the Lactic acid level increases and a stage come when pH level decreases to such a level so that the Lactic acid provides help in growth of bad bacteria which causes spoilage of milk. The normal standardized pH of fresh milk is about 6.5-6.7, it may increase or decrease with the type of impurity added to it but if a sample of fresh milk is kept at room temperature its pH gradually decreases with the passage of time, milk is getting sour. The normal standardized pH of fresh yogurt is about 4.4 , it may increase or decrease with the type and quantity of bacteria added to it at time of its production, if a sample of fresh yogurt is kept at room temperature its pH gradually decreases with the passage of time, yogurt is getting sour. 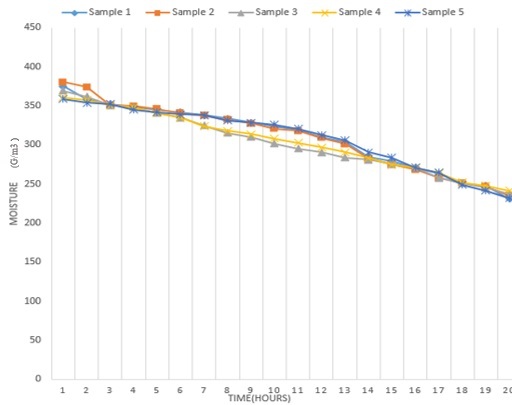 Figure 3 shows the trend of 5 samples of yogurt and the pH level with the passage of time. The moisture contents in meet items is one of the important property which ensures freshness,  if a sample of fresh piece of chicken is kept at room temperature its moisture level gradually decreases with the passage of time, And chicken pieces will get dry and smelly with production of different organisms which causes chemical changes and results in spoilage of meat. 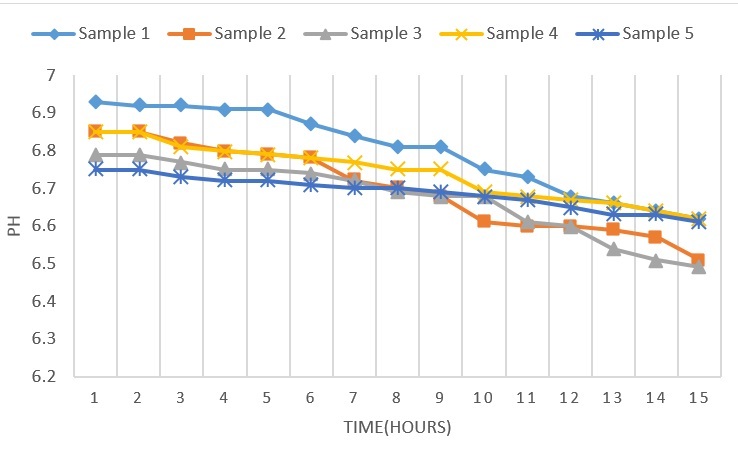 Figure 4 shows the trend of 5 samples of chicken and the moisture level with the passage of time. The moisture in meet is one of the main property which ensures freshness, if a sample of fresh piece of beef is kept at room temperature its moisture level gradually decreases with the passage of time, and beef will get dry and dry as moistures contents decreases. 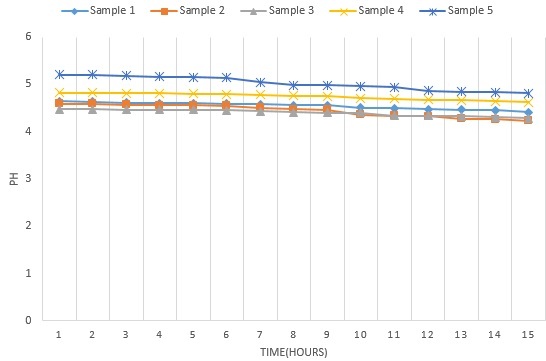 Figure 5 shows the trend of 5 samples of Beef and the trend of moisture level with the passage of time. The production of alcohol level starts as the banana starts ripening with appearance of black spot on banana which causes softening of fruit. The black spots level increases with time and a stage come when the fruit is ripened and different type to fungal growth starts on its surface. 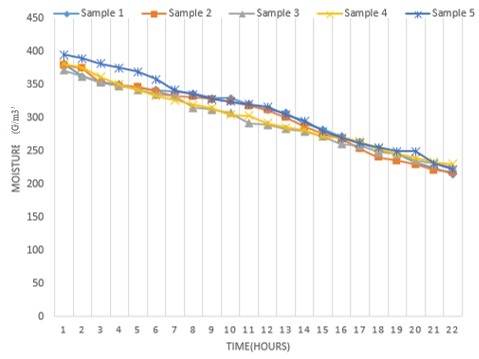 Figure 6 shows the trend of samples of banana and their production of ethanol with the passage of time. An embedded system can be installed in it which can send data back to a centralized server where it can be used for different research purposes and user can see history of data. For further improvement in results, add an Artificial Neural Network in the server which can read data and send the results to the terminal devices which can use this data for devising the better results in future about the food spoilage. Right now, we are testing few dairy and fruits items. Our plans are to expend the device for more items by adding new sensors and by using existing sensors. Food poisoning has been the source of innumerable diseases, to reduce and avoid illness we use biosensors and electrical sensors to determine the freshness of household food items like diary, fruits, and meat. eFresh consists of hardware device and an android mobile application. 1. Connect to Bluetooth module. 2. The user can use to select the type of food to be checked. 3. User can see the results on LCD attached to device. 1. "Norovirus food poisoning", Foodborneillness.com,2018.[Online]. Available:http://www.foodborneillness.com/norovirus_food_poisoning/. [Accessed: 28- Jun- 2018]. 2. "http://time.com", Time, 2018. [Online]. Available: http://time.com/3768003/351000-people-die-of-food-poisoning-globally-every-year/. [Accessed: 28- Jun- 2018].